I love knitting socks. They are challenging and there are an endless supply of different and diverse patterns out there. But while I love that first sock, giving it my undivided attention; I hate the second one quite vehemently. So rather than continuing to make two, trapping myself for convention, I have chosen, instead, to turn each first sock into a work of art in its own right. Henceforth, the Single Sock was born. • Read the story behind the socks. 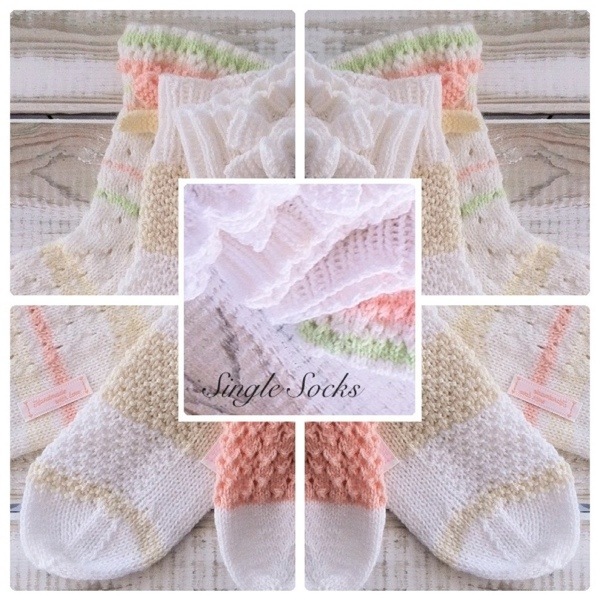 The idea of the Single Sock is to give it pride of place on your wall. To hang it and to admire it. To appreciate it and to revere it. To keep it without taking anything from it – and that means wearing it, even if you do so happen to find yourself barefoot and desperate one foot forlorn day. It is a sole mate not a foot servant. • Click on the images below to go to my online gallery where you can see each piece enlarged, find out more about it and buy either it or a print. Please note: my gallery takes a 30% commission, which is included in the listed sale price. The price is also quoted in $’s. Visit my shop to see the price in £‘s and save 30%.